Here is a card you don’t see very often. 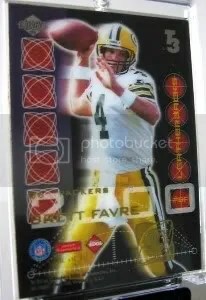 This is a 2000 Collector’s Edge T3 LeatherBacks insert of Brett Favre. These aren’t called LeatherBacks for nothing. 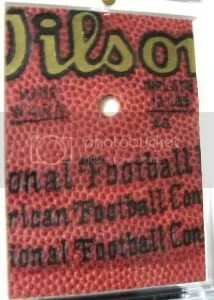 The entire backside of the card is covered with pigskin from an authentic game-used football. LeatherBacks is a 20-card set and each card is limited to only 12 copies. The backs of these cards look really cool compared to ones with just stats.